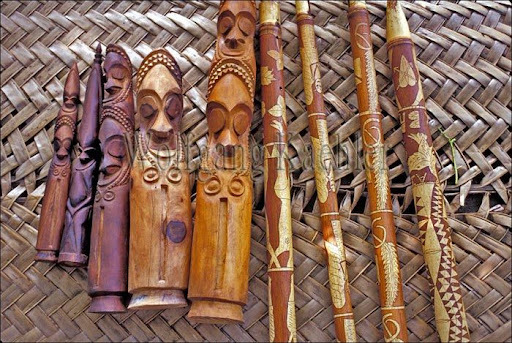 he traditional/folk music of both New Caledonia and Vanuatu is Melanesian in nature, meaning it features vocal chants and instruments like log drums rather than the melodic, Church-inspired multi-part harmonies prevalent in Polynesian music. Modern musicians from both sets of islands have adopted guitars and keyboards and have embraced global genres like rock and reggae. Still, when they go back to their roots, they find those roots in the percussion and chants of their Melanesian forefathers. In New Caledonia most every traditional ceremony or community event is musical, with much singing, playing of conch shells, drums and bamboo flutes and, of course, dancing. The pilou dance is especially important in the Kanak culture; according to Jane’s Melanesian music page, “The traditional pilou dance tells the stories of births, marriages, cyclones or preparations for battle, although colonial authorities banned pilous in 1951 for the high-energy and trance-like state they induced in the dancers.” We’ll learn more about the Pilou below. As the New Caledonian independence movement rose in the mid 1980s, so rose a genre known as “kaneka,” which fuses the traditional music of the indigenous New Caledonian people with global world pop. According to Mondomix.com’s “Kaneka music, a banner of identity for the Kanak people of New Caledonia,” kaneka music “allied traditional rhythms, like the ‘chap’ and ‘bua’, the ‘aÃ© aÃ©’ chants from local ceremonies and dance tempos with modern instrumentation….Kaneka was a federating music and its artists carried their share of responsibility for allying the Melanesians in their quest for a modern identity.” Despite kaneka’s popularity in New Caledonia only a very small number of artists, like the kaneka-reggae artist Edou, became known beyond the islands’ border. We’ll learn more about him Edou below. Kaneka’s popularity in New Caledonia ebbed and flowed with the Kanak enthusiasm for independence. Mondomix suggests that the upcoming move toward independence, as mentioned in the history section above, is creating a fertile landscape for the reemergence of kaneka, and this time kaneka may become a global musical force. Traditional music of Vanuatu is known, in Bislama, as “kastom singsing” or “kastom tanis.” This is a blanket term that covers everything from tamtam/slit gong drumming to wonderful drum and vocal music like this. Most kastom singsing is drum-based, though some adds bamboo flutes and conch shells to the mix. A more modern and quite popular style of music in Vanuatu is called “stringband.” Like the stringband music of Papua New Guinea, this genre adds guitars and other stringed instruments. [Listen to some Vanuatu stringband here. And some more here–great stuff.] International music such as zouk and reggaeton are also popular, both with ni-Vanuatu and with tourists who have spent the day on the beach, have bellies full after a grand Vanuatan dinner and flock to nightclubs to dance their sunburns away. — Edou, “Millio” Edou, a member of the Drueulu Tribe which is based in the Lifou (Loyalty Islands), rose to New Caledonian popularity in the mid-80s and went on to tour the Pacific Islands and beyond with his inventive form of kaneka-reggae. When the reviewer who wrote National Geographic World Music’s profile of Edou saw Edou perform at the South Pacific music festival, the artist’s “first rate” band included New Caledonia’s minister of culture. Fortunately, “The minister can really jam.” Watch from on-stage as Edou and his first rate band perform “OcÃ©nie” live. Watch Edou’s video for “Le Dela” (you can actually see his face in this one). Vanessa Quai is Vanuatu’s most widely-known female vocalist and one of the only ni-Vanuatu musicians to have toured beyond the Pacific. Quai has been singing professionally since she was nine years old and launched her career by placing third out of 3,000 singers in the Gospel/Inspirational Category at the South Pacific International Song contest and first in the Nile International Children Song Contest in Cairo. Quai’s songs range from gospel to reggae to hip hop to R&B. She sings in many languages such as Motu, Tok Pisin and Fijian.